Please join us on Tuesday, February 19 at 6 pm to hear New York Times bestselling author B. 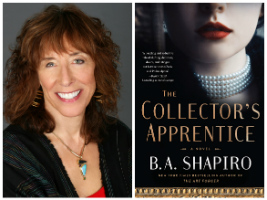 A. Shapiro talk about her latest novel, The Collector's Apprentice. After her talk, B. A. will be pleased to sign copies of her books. The Collector's Apprentice is a page-turner about art fraud, theft, scandal, murder, and revenge against the big backdrop of Paris between the wars. B. A. Shapiro has made the historical art thriller her own. In The Collector's Apprentice, she gives us an unforgettable tale about the lengths to which people will go for their obsession, whether it be art, money, love, or vengeance. B. A. Shapiro is the author of eight novels (The Collector's Apprentice , The Muralist, The Art Forger, The Safe Room, Blind Spot, See No Evil, Blameless and Shattered Echoes), four screenplays (Blind Spot, The Lost Coven, Borderline and Shattered Echoes) and a non-fiction book, The Big Squeeze. The Art Forger has been on many bestseller lists—including the New York Times, Boston Globe, and LA Times — and has won many awards including the 2013 New England Book Award for Fiction. She lives in Boston and is working on her ninth novel.